Rangeland ecosystems which include unimproved grasslands, shrublands, savannas and semi-deserts, support half of the world’s livestock, while also providing habitats for some of the most charismatic of wildlife species. This book examines the pressures on rangeland ecosystems worldwide from human land use, over-hunting, and subsistence and commercial farming of livestock and crops. Leading experts have pooled their experiences from all continents to cover the ecological, sociological, political, veterinary, and economic aspects of rangeland management today. 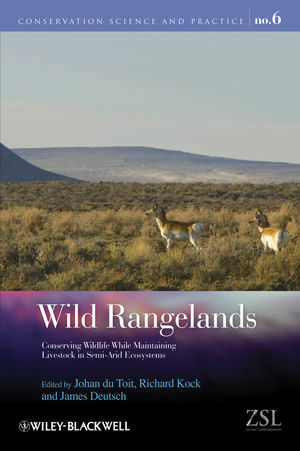 This book provides practitioners and students of rangeland management and wildland conservation with a diversity of perspectives on a central question: can rangelands be wildlands? Johan T. du Toit is a professor at Utah State University, where he is the Head of the Department of Wildland Resources. He is especially interested in the ecology of large mammals and the conservation of terrestrial ecosystems through the fusion of science and management.